Terra White Interview with Reality News Online (Sept 2010) | Where are the models of ANTM now? Terra was the second girl sent packing this cycle of America’s Next Top Model not after a photo shoot, but after the judges felt that she just wasn’t taking her new look to the next level after her extreme makeover. What are her thoughts on the early exit? Find out here! I figured that since Terra and Chris were going into this whole thing together as sisters that there was no way that both of them wouldn’t make it to at least the final seven or so. I was shocked that Terra was sent home so early, and not only that, but right after her makeover. I had a chance to chat with her about her time on the show, and here is what she had to say! RealityNewsOnline: Hey, Terra! Thanks for taking time out of your schedule to chat with me today. How much of previous seasons of the show had you watched, and why did you decide to apply? Terra: I saw a majority of them, although I did miss some episodes along the way. It was easy for me to apply, though, since my family always thought that I should try out and they encouraged me to do it all the time. I actually applied three other times and didn’t make it very far. This time just worked out for me. As for my sister, this was the first time she applied, and it was with me. She was always doing other things and wasn’t old enough to apply. RNO: Going into the auditions with your sister, did you feel you were going easy on her at all, or did you feel you were being as competitive as possible? Terra: I really wasn’t all that worried about it. What you saw was me being worried about myself, not even really worried about her. I mean, if Chris needed advice, I would give it to her, and she would do the same for me, but there was never a point that I was focused more on her than myself. RNO: It felt like after you had landed in the bottom two after the first photo shoot that you had given up. Was that the case or did you feel like you were still giving it 100%? Terra: Oh, I had said on the show that it would be the last time I would be called last! After that first shoot I was in the mindset that I was never again going to be in the bottom two. I never gave up. That makeover was a bit of a shock for me, but even then I didn’t throw in the towel – after all, I did it! RNO: Was there any truth behind what Jay Manuel said when you were eliminated, that you didn’t look like you believed that you should be there? Terra: No, I really wasn’t paying attention to all that. The whole time they were cutting my hair, he was talking to me, telling me about how they were doing it for a reason, and not for anything. So that was in my head – that I was going to the next level with that look. Then they eliminate me. Made no sense. RNO: Your comment after being eliminated was something along the lines of you wish they had eliminated you before giving you a makeover. Did you ever feel like the judges knew it would be you sent home or do you think it was a fair playing field? Terra: I really can’t say what the deal or the situation was. I felt like there was no reason for me to go home when I did. You saw it, and even Jay said that I was getting better as he was asking me questions. I’ve come to the conclusion that I will never fully know the reasoning behind my elimination. RNO: Looking back, do you think that had you changed your attitude about your makeover, that you would remained in the competition? Terra: No, if I was upset I’d just say something. I mean, I’m African American, and you don’t understand that it takes many long hours to simply change a hairstyle when you are this way. It’s hard to change your attitude when you have to sit in a chair for so long. It’s even harder when you don’t fully understand why you were eliminated. RNO: Going into the competition, from the very first audition, what did you feel would be your biggest strength? Terra: My walk. I love runway, and that is where my strength is. I’m outgoing, and I didn’t hold back anything the entire time I was there. I knew that photos would be a struggle for me, but I was hoping my walk would help me at least carve my way until my photos improved. RNO: What would you say was the thing you most unexpected from being on the show? Terra: You know, the cameras. You expect it and know they will be there, but I don’t think I prepared myself enough. It was much more than I expected, and it was definitely overwhelming. I’m a private person to begin with, so it’s rough knowing that everything you are doing is being captured and may be put on TV. I definitely wasn’t prepared for that. RNO: Now, I have to ask you, only since Anamaria cancelled all her interviews. Was she really as negative and nasty as they showed her, or did we get a very good piece of editing of her? Terra: She’s really not as negative as they showed her. The thing about Anamaria is that she has this New York City thing going on and people just take her the wrong way. I’d say editing definitely had a part in the way she was portrayed. She said what she said, but some of it was taken out of context; she’s a really sweet girl. RNO: The judges this cycle are all about high fashion. From what you’ve observed, were you shocked that some of the girls made it to the house from a high-fashion standpoint? Terra: I know that some of the girls made it into the house and I had no clue what the judges were thinking, but then you have to realize that there is something that the judges and Tyra see in them that maybe I just don’t. After the makeovers were finished on some of the girls, I totally got what the judges saw, and that’s when a light bulb goes off, but it’s not my decision who gets in so I think they did a good job. RNO: Not being eliminated due to a true photo shoot must have been very frustrating. Do you feel had you been given another chance with the next shoot that you could have redeemed yourself? Terra: That was a definite. After I figured out what I was doing wrong, I felt like I was really coming into my own. I wasn’t a photo type of person; I knew that going in. I had to learn angles and facial structure, and I felt like I was doing that. I was in the mirror the whole time working to make things look better, and I didn’t even get a chance to show that I was growing. That was the most frustrating part of all. RNO: What are your plans from here? Is modeling still something you plan on trying to do? Terra:I’d really like to just do everything that I’m given a chance to do. I’m going to take every opportunity that comes my way and hope that it will take me to the top. If it doesn’t, I do have a degree in health that I can fall back on, and I’d love to teach somewhere down the line. RNO: Where do you see yourself a year from now? Terra: A year from now I’d like to see myself proving everyone wrong. I’d love to be in a few magazines and walking some runways. I want to show that I really can make it in the industry. Terra: I’m just going to say that you better keep looking out for me and hopefully this isn’t the last time that you hear from me. I’m going to do me, that’s for sure! 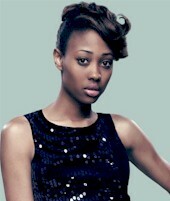 To learn more about Cycle 15‘s Terra White, visit her bio page here.